An exotic tuna fish normally found in tropical seas off India and Sri Lanka has been caught in British waters for the first time. 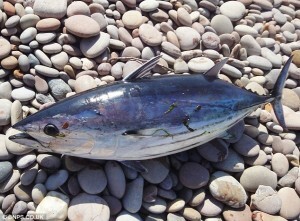 The 2ft skipjack was grabbed as it swam up the River Otter at the seaside town of Budleigh Salterton, Devon. Fisherman Leo Curtis took it home to barbeque and said: ‘The taste was incredible – it was just like steak’. Skipjack tuna are usually found in tropical seas but experts say the fish could have been attracted to Britain’s coastline due to rising water temperatures. There are no records of one ever being caught in UK waters. Leo Curtis and friend Ian Carrott had been fishing on the beach when they spotted the 20lbs fish in six inches of water in the river estuary. Mike Heylin, chairman of the British Record Fish Committee, confirmed the skipjack tuna is the first to be caught in the UK. He said: ‘There are no records of a skipjack tuna being caught in British waters so this is a first. ‘I’m not surprised in the least though – every year we are seeing increasing numbers of what would be considered sub-equatorial fish in our waters. Skipjack tuna – Katsuwonus pelamis in Latin – are the smallest and most abundant of the major commercial tuna species.They are found mainly in the tropical areas of the Atlantic, Indian and Pacific Oceans.